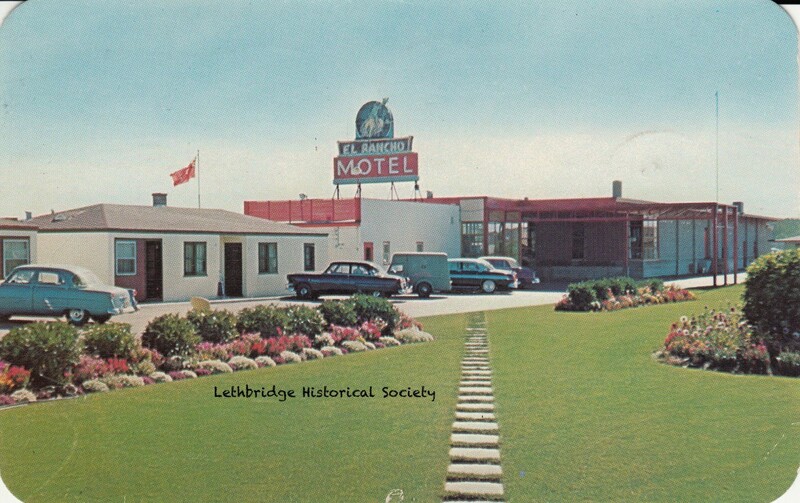 In Lethbridge we are fortunate enough to have the fantastic Lethbridge Historical Society who shares out delightful period photos of Lethbridge and area on their Facebook page. Their photos are often great opportunities for car spotting. A few days ago they posted this 1950s photo of the El Rancho Motel complete with a line up of vehicles parked out front. The small delivery van in the middle struck me right away as something I could not identify. Any ideas? While it is a wonderful photo unfortunately the angle is not ideal for determining the make of the little van. Hopefully they do not mind me sharing this photo in the quest to identify the deliver van. The original post can be found here along with a description and history of the El Rancho Motel. I’ll guess based only on size and what I think I can make out of the rear wheel. For the size, it’s probably a European car (I wonder if there were any European vans imported in the ’50s to the US, but that’s what I think). The rear wheel looks a lot like those installed in British Ford Prefect/Anglia/ Fordson Thames that were produced from the late 30’s to the very early ’50s. So, it just might be some kind of Thames van. Based on just a hunch, though. The rear fender also looks similar to those in British Fords. Edit – Nah, an Imp isn’t old enough..
It’s not, but thank you. You made me aware of yet another long roof with a rear engine I had never heard about! There were several Imps and other Rootes rear engine siblings around here (Uruguay), including coupes, but never saw a wagon. That was my immediate thought as well, yesterday, but the date’s not right, the rear overhang too short and the size too small. So I’m officially stumped! When I worked at Glacier National Park in the summer of 1973, I and other students would sometimes hitchhike up to Lethbridge on our days off. I don’t remember seeing this motel, but one day two of us from the park toured the Lethbridge Old Style Pilsner brewery. There were maybe six people on the tour that day and the very nice gentleman conducting the tour showed us everything. Afterwards, he sat us down at tables and proceeded to serve us as much beer as we wanted. I’m leaning towards something custom. The “sleeper” area over the cab doesn’t appear in any of the post-war Fords or other European panel-vans that I’m aware of. I think Ford Thames is a good guess since there were a few on the streets of Edmonton when I was a kid. The local ice cream truck was a Thames and rather worn looking by the mid sixties. Could it also be an Austin? Not sure if they made pickups or panels but the sedans were a popular import to Canada in the fifties. I think it’s some sort of 1/4 ton truck with a fiberglass shell covering the bed. Agreed. From the shape of the door window and the treatment around the rear wheel, I think this may be a Morris Minor pickup with a custom van body that also extends the length beyond where the tailgate would normally be. I feel like the A pillar/windscreen and the distance between the door and rear wheel look wrong for a Minor. My guess is it’s British but older – or the design is anyway. I don’t have a guess but some of the visible features lead me to believe a “custom” body on something small and/or short in wheelbase. 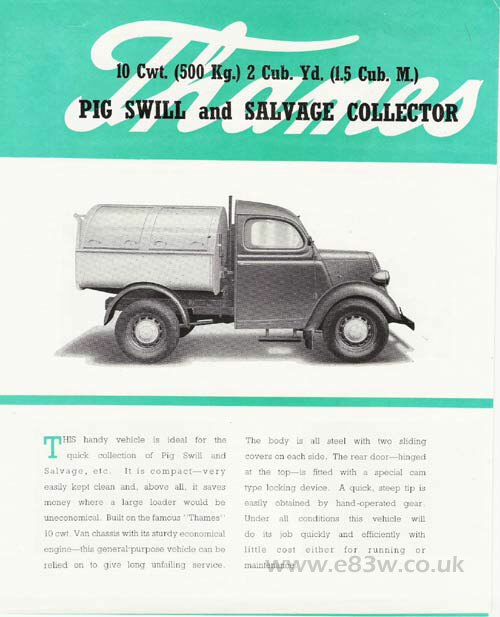 Or…a vehicle from a builder of commercial only trucks, like International Harvester? For example, the rear fender looks like it is separate from the box that is the main body…so something from the 40s? Oddly? I always associate vehicles with extended roofs as being a late 60s and newer creation. The proportions look like a Morris to me. My guess is conversion of an Austin Light Utility. There would have been lots of British vehicles in Southern Alberta during WW2 with Commonwealth Air Training Bases and there was a POW Camp in Lethbridge which housed about 12,000 Germans until 1946. I don’t think it’s a delivery van. I think it’s a mobile canteen van, which were used during wartime. Most of them were Fordson E83W, aka Ford Thames. That’s unquestionably correct. The fourth picture on that site is exactly the same. I wonder if the truck was still being used as a lunch wagon or something similar? That’s exactly the car I thought. My wife’s uncle had a “woody” Fordson , which at 30 years old (around 1984) was still running flwalessly at top speed…around 65 km/h. Definitely not an adequate vehicle to use as a daily driver in the ’80s. It had black fenders, BRG body, and a wooden rear canopy, with an extra row of seats. That is some impressive sleuthing – I think that is a match. I don’t think so. 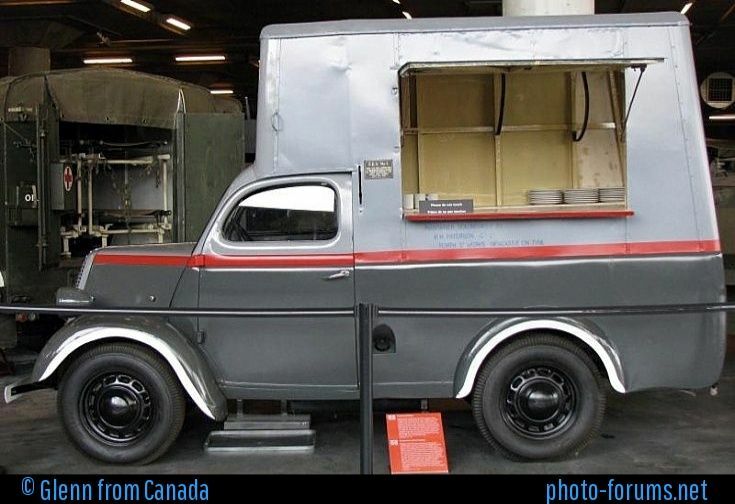 The canteen van you show has a taller roof; note that the over-cab portion is significantly bigger than the cab window; thta’s not the case in the picture of the one at the motel. Also, the canteen van has a perfectly flat front end, whereas the motel van has a bit of slope to it. The overall proportions are just not the same. It may well be a Thames van, although to me the side window of the one Desmo showed looks to be a bit shallower than the taller window on the motel van. Even if it is a Thames, it’s something other than one of those canteen vans. Van bodies were invariably custom made back then, and the one at the motel looks like a typical delivery van of the time. The exact maker will probably forever be a mystery. The canteen van’s body is taller, but appears to have a bit less rear overhang. There were so many variations of these van bodies back then. Given the relative squareness of the front door (contrast to the all-of-a-piece pressed door on a standard E83W) I wonder if it might be a pre-War design, which may well have still been in production until 1947/48 depending on manufacturer. I agree with Paul that the bodywork itself is going to be a custom job, on the factory supplied chassis/cowl unit. It’s unfortunate we can’t see anything of the bonnet and front wings though. Actually in taking a closers look the lines of a canteen truck side opening do appear to be there, so it is quite likely a canteen truck. But it’s not quite the same as the one Desmo posted in his comment. But then that’s hardly surprising. As I understand that canteen design didn’t disappear after WWII and was later used for ice cream vans, which are by definition custom built. However it is a Thames/Fordson because of wheel arches. Other hot candidates are Landrover and Bedford OX30, but then again- no fitting wheel arches. An early 1950’s Morris J-Type Van?? The driver of that van, pulling into the El Rancho Motel one fine day in the mid-1950s, would have no idea that people 60 years later would be having intense discussions over what type of van he has. or of how much easier he’d have made it to identify if he’d parked to the left of those cars, rather than between them. (OK, that car might not have been there when he arrived!). But is that a pack of Camel’s or Chesterfield’s on the dashboard?